"With great power comes great responsibility, and also – if you’re talking about Intel’s 2011 Sandy Bridge processor line-up, at least – generally sizable pricing. 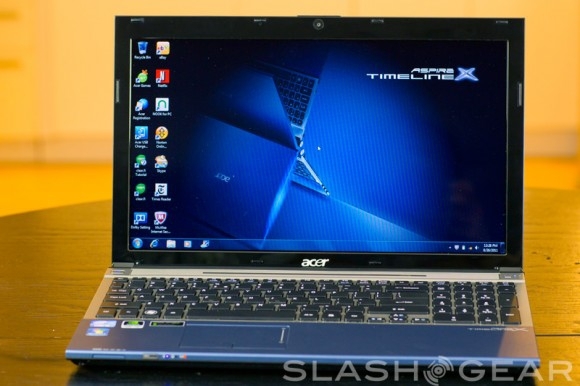 Acer is looking to change that with the new Aspire TimelineX AS5830TG-6402, a lengthy name for a 15.6-inch Core i5 notebook that ticks all the spec boxes for a high-speed desktop replacement only with a bargain $799.99 price tag." Another laptop seemingly similar to many others in the marketplace, in the desktop replacement category. With a somewhat industrial design, it has USB 3.0, a 1.3 megapixel webcam, a good but glossy screen at 1366x768, a full-sized keyboard with numeric keypad, and a multitouch touchpad. With Windows 7 Premium 64-bit, Acer also includes a ton of apps and unfortunately a ton of bloatware pre-loaded on a slowish hard drive. Performance is very good, with strong video performance and the ability to play some games well. Acer quotes a (6-cell) battery life of 9-hours, but the real numbers were 2-3 hours of normal usage, up to 6-hours of light web browsing. Bottom line is that this is a good notebook with reasonable size, good performance, for a very good price. But, again, come on vendors, give us reasonable, simple product names that we can remember!